There are more than a dozen new products described in this Update. All are available now in Palladium’s online store. And there are a fair amount things going on. I hope you enjoy this Weekly Update during the holiday weekend. The 2015 Palladium Open House ended on Sunday, May 17, and it was nothing short of fantastic. Many people told me they thought it was the best one they had ever attended. Gamers new to the Open House were amazed, saying they had never seen anything like it and that it was the best convention they had ever attended. Awesome. That was exactly the reaction we had hoped for. Likewise, new guests and old friends who had never been to an Open House, such as Jolly and Barbara Blackburn, Tina Simmons, Victor Peterson and Matthew Balent (and his family), were equally blown away. It was awesome having Jolly and Matt B. at the Open House, because it had been years seen we’d last had a chance to see each other, sit and chat. We videotaped everything, but had audio-visual difficulties (we made a poor choice of camera)! Which is a shame, because the panel talks between me and Jolly Blackburn and me and Matthew Balent were nothing short of epic . . . at least for me. So was the closing ceremony in which I was pretty “on” and had the audience laughing throughout the two hours. We had a great time. We do have some video that should be usable, and we will post what we can soon. Was this the last Open House? At the Open House itself, all weekend long, we told people that while nothing was written in stone, we intend to make the 2015 Open House our last one. And as of right now, that is our intention. HOWEVER, something happened that could be a game changer. It was suggested during the Closing Ceremony’s Q&A session that we crowdfund the next POH. A successful crowdfunding campaign could provide the funds to have V.I.P. night catered by someone other than Kathy, and enable us to hire some paid helpers for the weekend, not just volunteers, to handle set-up, concessions, cash registers and grunt work like taking out the trash (we filled the entire dumpster from top to bottom! ), refilling shelves, continually making fresh coffee, cleaning, etc. The remaining crowd of at least 70 people cheered the suggestion and said they would support such a fundraiser if it meant having another Open House. It was an incredible suggestion we had not considered. A tip of the hat to the gent who suggested it. The petitions for another Palladium Open House were continual all weekend, but they were so gentle, kind and heartfelt that we will seriously consider the possibility in future. Your passion about the POH and the love exhibited was very moving and touched our hearts in a deep and wonderful way. You all made us feel very special and loved. Thank you. The pleas to do another Palladium Open House in 2 or 3 years (and more every 2-3 years after that) were profound and touching. A number of people teared up as they said goodbye at the thought of this being the last one. Hendrik, as usual, spoke elegantly about how special the Open House was to Palladium fans and why he hoped this was not the last. My old friend Matthew Balent said he will come to the next one when (not if) we have one, and even Ramon K. Perez, who could not make it to the Open House this year, sent me an email today saying how he hopes we’ll do another one so he can attend. Your sweet voices have been heard, and we will give the possibility the consideration it deserves. Whether we’ll do another one, crowdfunded or not, is yet to be determined. Our 2015 volunteers were the best ever! All were a tremendous help. That included Joseph Bergmans, Christopher Guertin, Shawn and Lisa Hall, James, Diane and Connor Brown, Stacy Leath, Doug Lamberson, David “Chase” Murphy, Victor Peterson, Tina Simmons, the Palladium Staff, Patrick “Jake” Jakubowski and all the Game Masters who ran games and people who pitched in to help on every front. And there were lots and lots of them, like Paul, Ian, Matt, Doug, Jessica, Mark, Mike, and many, many more. A special thanks to our “employee” of the month: Federico Franceschi, who was a great help with the set-up for the POH and is an all-around great guy and a new friend. Honestly, it seemed like EVERYONE from gamers to artists and writers pitched in to help us set up, maintain, clean and tear down. A heartfelt thanks to all of you from all of us. You helped make the 2015 Open House the easiest and most organized one ever. I think it is my second favorite after the very first one. The people in attendance were wonderful and very generous in their kind words, help and warm regards for all of us. Thank you, everyone. The feelings are mutual. I’ve said it before, and I’ll say it again, Palladium fans are the greatest. The Open House is always a wonderful experience, but this one seemed extra special. It has certainly recharged my battery and I think everyone here. We appreciate you making us feel so special. Much more about the Open House with greater detail and much larger overview, including the details about my six-part game, the Robotech® RPG Tactics™ tournament (which people raved about), and other events will either appear in a separate and Special POH Report and/or as numerous Murmurs from the Megaverse®. Speaking of which, I had intended to post a little something every day, but as usual, I packed my schedule so heavily that I didn’t have a moment’s rest. And by the end of the night, sometime between 11:00 PM and Midnight, I was too worn out to think coherently enough to write anything. I won’t do that again if there is a next time. Watch for the POH details and adventures that will be coming your way soon! Matt Lemke, the video podcaster from Through Gamer Goggles, came to the Palladium Open House for one day, but it was a busy day, as he conducted something like 12-15 video interviews with Palladium creators/writers/artists and staff members. The first two video interviews are already up and ready for your viewing pleasure. I’m told more will be posted today and over the weekend. Enjoy. Our focus for the next few months is going to be heavily on Robotech® RPG Tactics™. We want to see RRT Wave Two released by the end of the year, but we have a number of other things coming sooner to support the game line that we think will please our Kickstarter backers and all our supporters very much. We had a good talk with Harmony Gold USA last week and they have green-lighted our plans. We are hammering out the final details right now and will be in a position to start revealing them the week of June 1, 2015. We will also be working to get a few new book titles released before Gen Con Indy, including Robotech®: Expeditionary Force Marines™, amongst others. The RRT Tournament at the Palladium Open House went very well thanks to the efforts of Patrick “Jake” Jakubowski, who lost his voice Friday night, but still managed to run a dynamic tournament event. Several people also brought with them some impressive Robotech® ship models. Here are some of photos. Combatants liked the trophies and were surprised by the prizes given out. It was a great event. All the new T-shirts, mouse pads, prints and products that made their debut at the 2015 Palladium Open House are now available to you. Some are limited editions with a very small number available, so snap them up before they are gone (the 2015 POH T-shirt and “Raw” manuscripts come to mind). Other items were always intended for sale to everyone, but we wanted them to debut at the POH, first. Personally, I think the four new T-shirts are some of the best we’ve offered in a while. I also love the mouse pads, even though I don’t use one, the eight new prints are cool, and the dog tags are just fun. Wayne Smith is going on a well deserved vacation, so there won’t be a Weekly Update or emailing next week. Enjoy the long weekend, barbecues and many store sales, but also take a moment to remember the men and women who have died in service for this country, and to those in service right now. Whether your personal politics approve of any particular conflict or not, there is no denying that each and every person in military service, past and present, are patriots who put their lives in harm’s way to defend and serve this country, and to protect and preserve our way of life. They deserve a moment of our time – a pause and a prayer or a silent thank you – for their duty and sacrifice. I, for one, respect and salute you. My Uncle Leonard “Skip” Klonicki served in the Pacific in World War II. My Uncle Ted had a long career in the Navy. My father, Henry Siembieda, was an active duty serviceman during the Korean conflict, though he never saw action. All came home to us, but have since passed. I’ll be thinking of them and other uncles, family and friends who have served, or are currently serving, in the military. Thank you and know that you will be in our hearts and minds this weekend. Only 128 copies were printed, and only 67 copies remain available. 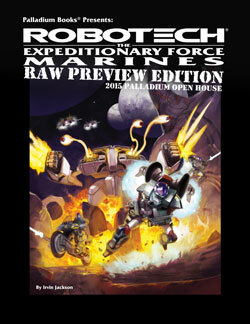 This is the “raw,” sneak preview of Robotech®: The Expeditionary Force Marines™. This is the entire book, without the artwork and possible additional material and changes. The Expeditionary Force Marines™ Raw Preview Edition is a super limited edition (our hardcover books are usually printed in quantities of 300-600 copies, sometimes more) and you get a rare chance to see the “raw” manuscript before it goes through final edit and layout. Note: Read the Purchaser’s Covenant! By purchasing this book, you agree not to post its contents online. We want people to enjoy the final book. No spoilers! New weapons, gear and character classes of the UEEF Marines. Expeditionary Force Marines – their history, goals and O.C.C.s. Many M.O.S. skills for character specialization. 12 new mecha, including Destroids, Battloids and Cyclones. The combat forces of the Invid Regent. Energy magic – 30+ spells. New Invid Inorganics and mecha. The Invid Regent, planet-hopping campaigns and more. Only 67 copies remain available. Sold on a first-come, first-served basis. Only 128 copies were printed, and only 67 copies remain available. This is the “raw,” sneak preview of two upcoming Rifts® titles, Rifts®: Heroes of Humanity™ and Rifts® The Disavowed™. About half of each book is present in this “Raw” Preview Edition. Artwork, more text, more stats, more weapons and gear to be added to both titles. 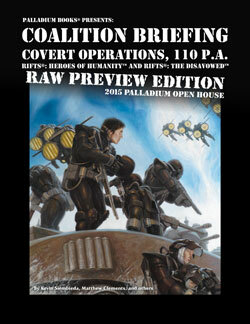 The Coalition Briefing™ “Raw” Preview is a super limited edition (our hardcover books are usually printed in quantities of 300-600 copies, sometimes more) and a rare chance to see part of the “raw” manuscripts for two upcoming Rifts® books before they go through final edit and layout. Note: Read the Purchaser’s Covenant! By purchasing this book, you agree not to post its contents online. We want people to enjoy the final books. No spoilers! Emperor Prosek’s call to arms. The psychological effects of the Minion War and demonic invasion. Fighting demons and supernatural monsters. New CS mecha and gear, including the Black Widow Spider-Skull Walker. The Disavowed, their leader, and their purpose. Using outsiders and the Vanguard’s role. New CS O.C.C.s, adventure ideas and more. Full color mouse pad that looks dynamic on any desk. 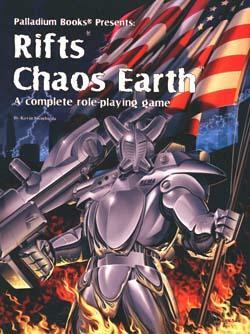 This art is the famous Glitter Boy™ in flames that was made into a poster and is the cover to the Rifts® Chaos Earth® RPG. 8 x 9 1/4 inches in size. 1/8 inch thickness of the pad. $9.95 retail – Cat. No. 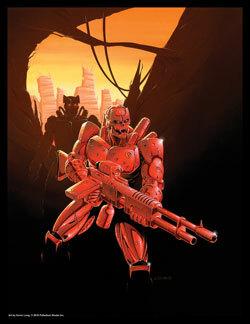 2566 – available now, but only from Palladium Books’ online store. Full color mouse pad that looks dynamic on any desk. 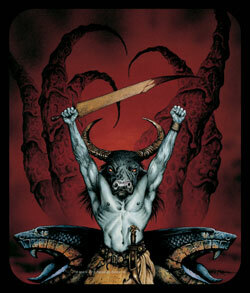 This is the powerful art depicting a Minotaur and Old One from the cover of the Old Ones™ Fantasy Sourcebook. The claw-like tentacles in the background is an Old One rising. Be afraid. $9.95 retail – Cat. No. 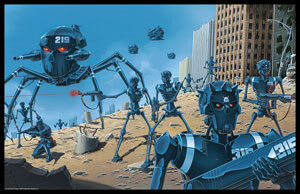 2567 – available now, but only from Palladium Books’ online store. Full color mouse pad that looks dynamic on any desk. This one is a zombie rising from a graveyard to stalk the living. 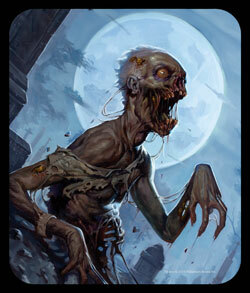 It is from the cover to the Dead Reign® Sourcebook: Graveyard Earth™. Are you a survivor? $9.95 retail – Cat. No. 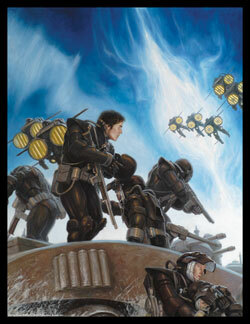 2568 – available now, but only from Palladium Books’ online store. 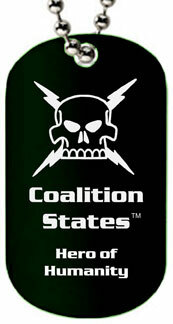 A sharp-looking, black dog tag, laser etched with the CS skull and lightning bolt, with the words “Coalition States, Hero of Humanity” on one side. The image and words are silver. Black dog tag with silver image and text. Comes with a 30 inch chain. A nice keepsake to wear or hang from your backpack, book bag, dice bag or shelf. Wear it during your game for inspiration and luck. $5.00 retail – Cat. No. 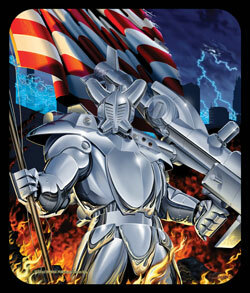 2569 – available now, but only from Palladium Books’ online store. A sharp-looking, ley line blue dog tag, laser etched with the full Rifts® logo and the words “Celebrating 25 years” on one side. The image and words are silver. Blue dog tag with silver logo and text. $5.00 retail – Cat. No. 2570 – available now, but only from Palladium Books’ online store. Color: White art and text on a black T-shirt. This shirt exudes both power and nobility, and a sense of wonder that captures the spirit of role-playing. Art by Freddie Williams III. Art by: Freddie Williams III. We wanted an image that said Rifts® and more adventures to come. This Ramon Perez artwork captures that nicely. And we love the grin on that Headhunter and the sparkle in his eyes that seems to say, “Oh yeah, there are adventures to come.” Art by Ramon K. Perez. Art by: Ramon K. Perez. NEW! 2015 Open House Dragon T-Shirt – Available now. This was not Kevin’s idea. In fact, he felt a bit embarrassed by it, but people loved it. This commemorative 2015 Open House T-shirt is perfect for those of you who attended the event as well as those of you who were there with us in spirit. 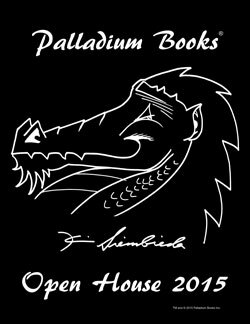 It features the infamous Kevin Siembieda signature dragon that graces thousands of books around the world with his signature; complete with Kevin’s signature and the words, “2015 Open House.” It seemed especially appropriate to us if this was, indeed, the last Open House. This shirt is not likely to be reprinted, so available only while supplies last. Art by Kevin Siembieda. Type: 90% cotton, 10% polyester. Color: Black art and text on a gray T-shirt. Cat. No. PR812 – $5.00 – available now. A hero on her night patrol to protect the innocent. 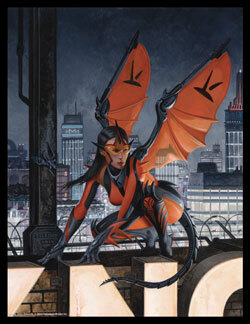 The artwork is the cover to The Rifter® #68, featuring a noble heroine on a city rooftop. Cat. No. PR813 – $5.00 – available now. An epic battle as a NEMA Chromium Guardsman (Glitter Boy) battles a legion of bizarre zombies. 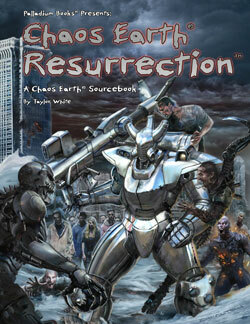 The artwork is the cover to Chaos Earth® Resurrection, featuring a Glitter Boy locked in combat with a zombie horde. Cat. No. PR814 – $5.00 – available now. Buckle your seatbelt for this wild ride. 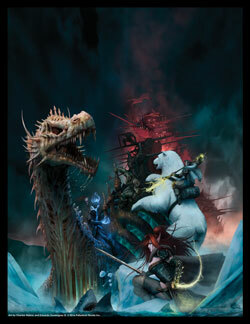 The artwork is the cover to The Rifter® #70, featuring a dragon in hot pursuit of a Coalition “Smiling Jack” SAMAS. Cat. No. PR815 – $5.00 – available now. The iconic Kevin Long “Red Cyborg” can now hang on your wall. The artwork is the cover to the Rifts® Bionics Sourcebook and appeared in the original Rifts® RPG. 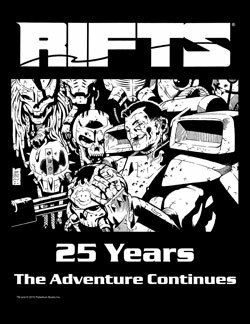 It seemed the perfect way to celebrate 25 years of Rifts®. Cat. No. PR816 – $5.00 – available now. The iconic Kevin Long “Ley Line Walker” can now hang on your wall. 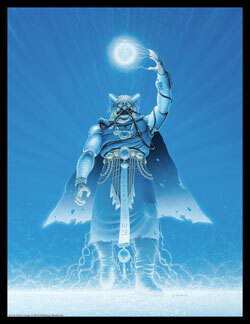 The artwork was used on a popular Rifts® T-shirt and appeared in the original Rifts® RPG. It seemed the perfect way to celebrate 25 years of Rifts®. Cat. No. PR817 – $5.00 – available now. The aftermath of a skirmish between Coalition forces and the minions of Hell. SAMAS scourer the sky for enemy forces as a Rift closes in the sky. 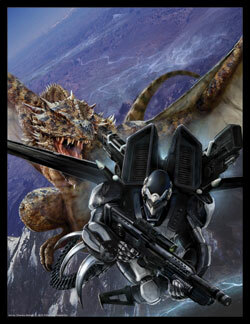 The artwork is the cover to the upcoming Rifts® sourcebook, Hereos of Humanity. Cat. No. PR818 – $5.00 – available now. Cat. No. PR819 – $10.00 – available now. 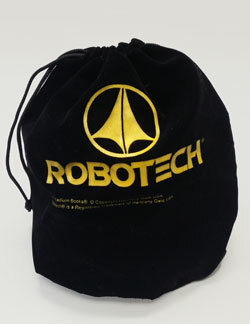 People have enjoyed the Rifts® dice bag for years, so we thought we’d do one for Robotech®. The Robotech® Dice Bag debuted at AdeptiCon and went over very well. Now it is available in the Palladium store for everyone. This is just one tiny thing we’ve been working on behind the scenes for Robotech®. More to come. Golden yellow color, silk-screen imprint. Black, faux velvet, draw-string bag. 7½ x 8 inch bag with flat, round bottom. Can hold a lot of dice. Suitable for any Robotech® gamer with a pile of dice. $8.00 retail – Cat. No. 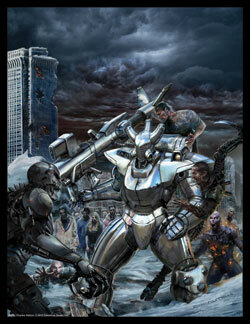 2565 – Available now, only from Palladium Books. Kevin pulled this amazing offer out of mothballs for the Open House and immediately sold a few copies. This is the most unbelievable deal we have ever heard of. In fact, we don't think anybody has EVER done anything like this before, and it's all John Zeleznik's idea. Each copy of the Collector's Masterwork Limited Edition includes an original piece of artwork by John Zeleznik! Most are concept sketches tipped (glued) into the book itself, by hand, done personally by Kevin Siembieda. That's right, YOU will have an original sketch/drawing/concept artwork from one of John Zeleznik's paintings or illustrations that appears in this very book! Fewer than 60 remain available. Limited to 199 copies. Each is signed and numbered. Signed by renowned artist John Zeleznik and writer/Publisher Kevin Siembieda. EACH contains a piece of original art by John Zeleznik. Usually a concept sketch from John's private archives. The book is identical to the regular hardcover edition. It is the original artwork and being signed and numbered that makes it special. $125.00 each, plus shipping and handling. Must be shipped UPS or insured so it can be shipped quickly and via a method that is safe and traceable. If lost in the mail, this item can not be replaced. 128 pages – color – hardcover – Cat. No. 2510-CML. To the civilized world, Bizantium and the waters and lands around it are frightening. A realm of sea serpents, monsters, and barbarians. To the heroes and people who live there, it is a realm of adventure, beauty and opportunity. 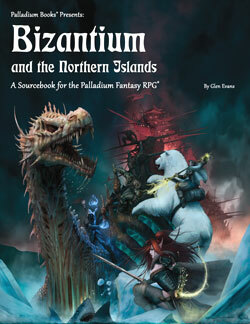 One might consider Bizantium as the center of adventure and mystery in the North. North of Bizantium are the Icy Ocean and Great Ice Shelf, places where only a handful of the bravest Bizantian sailors have ever set sail, and the rest of the world knows nothing about. For kingdoms in the south, only a few scholars have ever heard of the Great Ice Shelf or the cannibalistic Necromancers known as the Iceborn who make the frozen wasteland their home. Those who have heard tales of the land of ice and death are convinced they are nothing but the stuff of myth. Very soon, they will find out otherwise. And these are but a few of the revelations presented in Bizantium and the Northern Islands™. Discover for yourself the wonders and horrors that await. Waterchanter O.C.C. and 20+ magic spells new to the Fantasy setting. Necromancy revisited. Many spells new to the Fantasy setting. 90+ spells in all, including Ocean Magic for the Waterchanter, Necromancy and more. Serpent Chaser, Bizantium Marine and other new character classes. The Iceborn, their man-eating Raiders, Skinbinders and Sea Witches. A forgotten race of monsters who worship death, wield death magic, hunt humanoids, eat their flesh, and wear their skin. A villain you will love to hate. The Iceborn’s Necroilus – massive vessels made from the remains of dead sea serpents and animated by Necromancy to prowl the seas. Vengeful gods, monsters, sea serpents and sea monster creation tables. The Seven Treasures touched by the Northern Gods, lost for centuries, waiting to be found. New and old Bizantium ships including the Bireme, Ice Breaker and Battleship. Bizantium as never before seen. The Northern Islands described in new detail. The Great Ice Shelf – a new continent to explore. Bizantium’s origin, history, and mysteries revealed. Bizantian society, culture, religion, magic and notable places. People and places of note. Adventure hooks galore, and more. Written by Glen Evans, Matthew Clements and Kevin Siembieda. 192 pages – $24.95 retail – Cat. No. 474 – Available now. Expeditionary Force Marines – their history, goal and O.C.C.s. 160 pages – $20.95 retail – Cat. No. 553. If you love Robotech®, you’ll want to take a look at this game. Beautifully detailed game pieces of your favorite Robotech® mecha, and fast playing rules that capture the Robotech® experience in a new, exciting way. And this is just the beginning. We have so much more planned. Available NOW – in game stores across the USA, Canada, UK, European Union, Australia and New Zealand. Robotech® RPG Tactics™ "Starter Box" – Cat. No. 55100 – $99.95 retail price. This is the game Robotech® fans have wanted for decades. Robotech® RPG Tactics™ is a fast-paced, tabletop combat game that captures the action and adventure of the Robotech® anime. Two or more players can engage in small squad skirmishes or scale up to massive battles. Relive the clashes of the First Robotech War, engage in stand-alone tactical games, or use the dynamic game pieces to enhance your Robotech® RPG experience. Or simply collect your favorite mecha from an expanding range of top-notch game pieces. The First Six Robotech® RPG Tactics™ Expansion Packs are available to retail along with the main box game. Here are the SKUs and retail prices. UEDF Dice Pack – Cat. No. 55101 – $12.00 retail. 12 white, six-sided dice with red printing and the UEDF logo in place of the six. Zentraedi Dice Pack – Cat. No. 55102 – $12.00 retail. 12 purple, six-sided dice with yellow printing and the Zentraedi logo in place of the six. 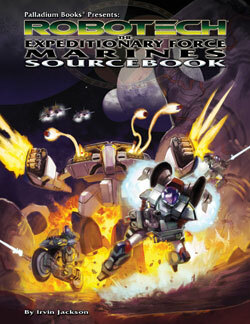 Robotech® RPG Tactics™ Rulebook – Cat. No. 55105 – $20.00 retail. Note: This is the same rulebook that is included in the main game box, and is offered separately for those who want an extra copy, or want to check out the rules before buying the whole game. Robotech RPG Tactics Template & Token Pack – Cat. No. 55106 – $15.00 retail. 10 UEDF Command Point tokens, 10 Zentraedi Command Point tokens, and one blast template. Battle Foam Robotech® RPG Tactics™ bag/carrying case – Cat. No. 55107 – $120.00 retail (limited supply). Note: We only have a few Robotech® RPG Tactics™ Battle Foam bags available. Once they are sold out it will be months before we manufacture more, if ever. In the shattered depths of Wisconsin, survivors are besieged by the dead come back to life. Zombies. But not just any type of zombie, zombies done Rifts-style. And unless the source of the zombie plague can be found and neutralized by NEMA defenders, North America may be overrun by the dead. This was actually something Taylor White and I have been kicking around for years, even before we released the Dead Reign® RPG line. We think you’ll love it. Something has animated the dead in Wisconsin. It is up to NEMA heroes to find the cause and stop it before it spreads beyond control. Scrap Zombies of all types. Snatcher Ghouls, Carrion Cleaners, Screaming Puppet Ghosts, Sour Maggot Parasites, and other monsters. The Zombie Pox and other dangers. Setting background, adventure and adventure idea table. 128 pages – $16.95 retail – Cat. No. 666. Spring/summer. The events unfolding in World Book 35: Megaverse® in Flames threaten to change the entire landscape of Rifts® Earth as the demonic minions of Hades and Dyval seek to bring Hell on Earth, and turn the planet into a dimensional gateway to Armageddon! The Coalition States, along with Northern Gun and Lazlo, take the lead in the defense of North America. 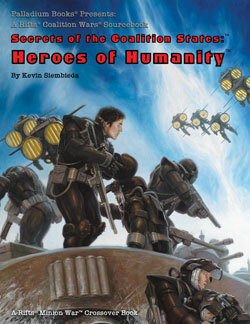 Heroes of Humanity explores the good and bad in the Coalition’s efforts to save humanity and send this new threat back to the pits of Hell. New Coalition weapons, armor and war machines. 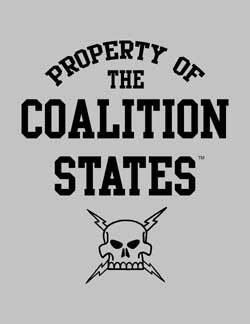 The Coalition States: Are they heroes or villains? Or does it depend on whether you are human or not? Can the CS fight alongside mages and D-Bees if it means saving the world? How is the CS dealing with the Minion War on Earth? One plan to battle the Xiticix and who really pays the price. Written by Kevin Siembieda, Matthew Clements and other contributors. Final page count and cost yet to be determined but probably 96 pages – $16.95 retail – Cat. No. 889. Final page count and cost yet to be determined, but probably 96 pages – $16.95 retail – Cat. No. 892. Final page count and cost yet to be determined, but probably 160-192 pages – $20.95-24.95 retail – Cat. No. 890. The Great Cataclysm has devastated civilization, but humanity fights for survival. The struggles of civilian law enforcement, fire and rescue, and everyday men and women are some of the most epic tales to be told in a world gone to hell. They fight monsters, aliens, the paranormal, the elements, and each other, all with the hope of reclaiming their lives from the Chaos. New D-Bees and monsters from the Rifts. New “average citizen” Occupational Character Classes (O.C.C.s). New equipment for NEMA “Roscoes” and other emergency personnel. Source information and stats for common Golden Age technology (weapons, vehicles, medical tech, etc.). Apocalypse Plagues brought from other worlds to Chaos Earth. Written by Jason Richards. Additional text by Clements & Siembieda. 96 pages – $16.95 retail – Cat. No. 665. Summer, 2015. We’ve all played “post” apocalyptic games. Now imagine playing as the apocalypse is happening. As the world you know is crumbling. As magic and monsters from myth become real and your world is reshaped by forces beyond your comprehension. That is the premise behind the Rifts® Chaos Earth® series. That YOU play through the Great Cataclysm as the apocalypse happens. Rifts® Chaos Earth®: Rise of Magic™ is a key book in that continuing story (new books are coming this Spring and Summer). 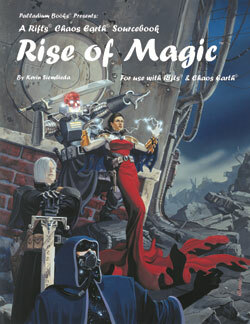 In Rise of Magic™, humans, particularly children, are discovering they can draw upon mystic energy and cast magic. The thing is, they don’t really know what they are doing. Magic is just part of the chaos and the impossible that is happening all around them. Meanwhile, others have found they can summon and control monsters and demons, while still others make pacts with supernatural beings to become witches and worse. And some have learned they can harness the magic to animate and command the dead. Madness and more chaos ensues. All of this only complicates things for NEMA, Earth’s defenders, as the line of distinction between “good guys” and “bad guys” begins to blur, and things go from bad to worse. 100+ unique Chaos Magic spells. Written by Kevin Siembieda. At the printer. Two new Chaos Earth® sourcebooks are coming soon. 64 pages – $12.95 – Cat. No. 662. Available now. 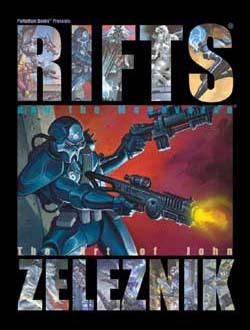 The origins of Rifts® start here! It is a new beginning. But first everything that human civilization had become during the Golden Age of Science, more than eighty years in our future, must come to a crashing end. The Earth is in the process of being transformed into a place more alien than a thousand alien worlds. Ley lines erupt with even more power and ambient energy than what is known on Rifts Earth 300 years later. Rifts – tears in space and time – appear along ley lines to unleash legions of aliens, monsters, dragons, supernatural horrors, and ancient gods of myth and legend in a mad symphony of chaos and transformation. You play survivors or the heroes of NEMA. The men and women of the Northern Eagle Military Alliance equipped with their Chromium Guardsmen (Glitter Boys), Silver Eagles (SAMAS) and host of other robots and power armor to stand against a rising tide of enemies and alien invaders. They are humanity’s last and only hope to survive the apocalypse that will become known as the Great Cataclysm. These are the heroes you play in a world that can only be described as Chaos Earth. Overview of the Great Cataclysm as it unfolds. Introduction to NEMA and its weapons and resources. 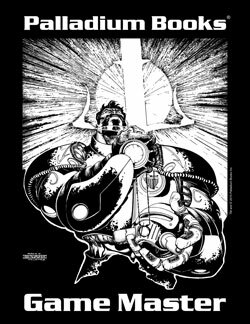 11 different character classes, including robot pilots, the Para-Arcane, Demon and Witch Hunters, Chromium Guardsmen, Silver Eagles, and more. Weapons, robots, power armor, vehicles and equipment. Monsters, chaos and adventure. Written by Kevin Siembieda. 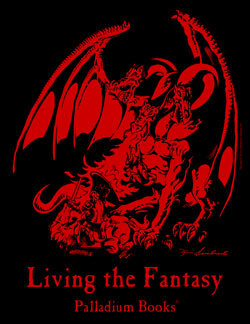 160 pages for the complete RPG – $20.95 – Cat. No. 660 – Available now! Chaos Earth® Sourcebook 2: Creatures of Chaos™ – 30+ Chaos Demons, NEMA and more. $12.95 – 64 pages – Cat. No. 661 – Available now. This awesome sourcebook is, in effect, Rifts® Atlantis Part Two. It is said that anything you may desire – especially if it is dark, magical or alien – can be purchased, for a price, at the Splynn Dimensional Market. Anything. ‘Nuff said. 14 more monstrous Splugorth slave races. New Magic Tattoos and Bio-Wizard organisms. Dozens of Bio-Wizard weapons and magic items. The deadly Bio-Borg and Kittani weapons and equipment. The Splynn Dimensional Market described and key locations noted. Art by Ramon Perez, Mike Dubisch, Burles, Breaux and others. $24.95 – 192 pages – Cat. No. 836 – Available now! The Rifter® #49-62 recently added – available now. © Copyright 2015 Palladium Books Inc. All rights reserved.